Spiral cooling towers allow to cool quickly production before starting its cutting or package. Such equipment significantly reduces time necessary for complete cooling of products. The casing of a tower is manufactured from stainless food steel. 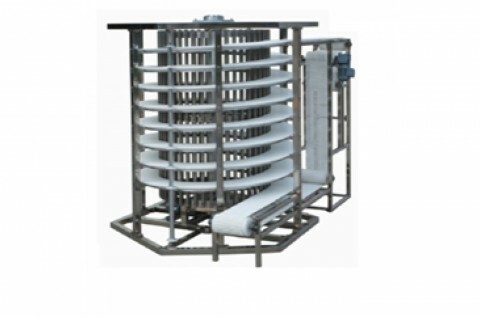 The cooled products are laid down on a modular tape of the conveyor which is set in motion by the twisting drum. Motion speed of the pipeline can be regulated. As material for a tape food is used plastic. It is very easy to remove and replace a tape. In case of overvoltage of a tape the security arrangement will disable it, thus, damage of a cloth is prevented. In each separate case overall dimensions of the equipment are defined individually with needs of the customer and features of location. The cooling tower is set to tunnel furnaces or integrated into the automatic baking transfer line.